Porters are a great item to have on your island home. Especially if you have one of the bigger islands. You can place a porter near your dock, and link its travel location near your front door. When you arrive with a new item to place in your house, you can run into the porter and you’ll automatically be ported to your house. It’s a great idea! So here’s how it works. Firstly you should know that teleporters are one way travel gateways. 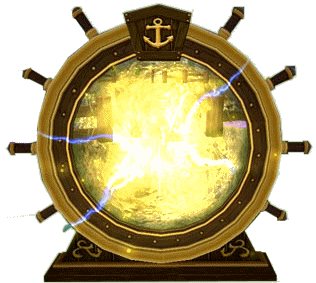 You’ll be able to run into the porter wheel and teleport to another location. But you won’t be able to go back as there won’t be another porter wheel to enter. This entry was posted on November 17, 2013, in Helpful Hints and tagged games, home, items, Kid friendly, kid safe, news, newsletter, online, Pirate101, Pirates, teleporters.